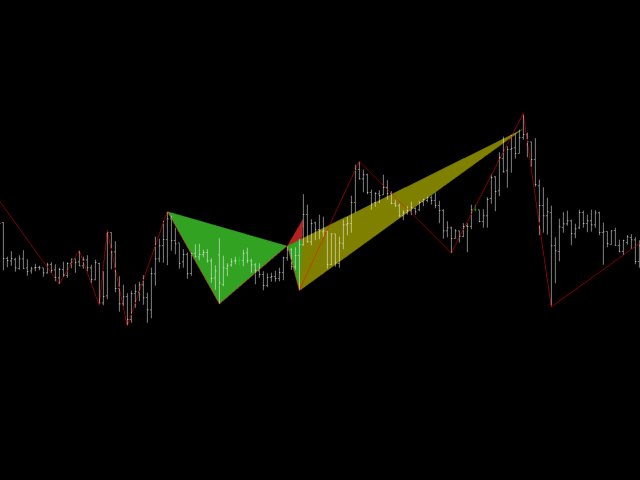 Harmonica is a XABCD chart pattern recognition Expert Advisor. The expert recognition of patterns helps traders to quantify and react to the changing market environment. This Expert Advisor will help in scanning the chart and spot developing XABCD patterns and trade them, it has the potential to scan multiple time frames and trade multiple timeframes as well. The genius behind this unique and one of a kind EA is that you can define you own XABCD pattern ratios. Advanced: Advanced is preferred as it not only work with the current chart period but all the TimeFrames/Periods higher than the current Period are used, if you attach it to a M1 Time Frame and select, then it effectively means the EA will work on all the available time frames for that symbol. Depth: The primary algorithm that the EA uses to calculate ratios is along the lines of a Zig Zag indicator, swing High swing Low, depth is the minimum number of bars to the left of each High or Low that are required to consider it a valid swing high/low. (Require more explanation? - get in touch). The lower the number the higher the number of Highs/Lows and the more tight your Zig Zag and your ratio points, the higher the number more reliable and less trades... choose wisely, if you do find a sweet number please share. Each Time Frame has its own depth value, this value is used as a global value. Logging Level: The EA spits a lots of logs, it can give you an indication of whats going on under the hood. I dont recommend None, Trace or Debug, unless something is terribly wrong and you want to submit some logs for analysis please stick to Warn, Error and Critical. Info level is ok too. The following parameters are repeated for each Time Frame, keep in mind that if the chart mode is Simple only the Chart current time frame is used and all other Time Frames are ignored. If the Chart Mode is anything other THAN simple and the current chart time frame and all other higher time frames are included as well. Avoid processing all the chart bars if you can, default value provided is a good number. Lots of ratio calculations go on here, sometime it is necessary to work with just PIPS and Sometimes PIPETTES (fractional digits) choose your value carefully.